The center of communication lies at our fifth chakra, the throat chakra. When in balance we not only speak, we listen. In order to have meaningful relationships we must be willing to listen as well as speak up for ourselves. They must be in balance. Although illness can affect this chakra, there is one culprit that always finds its way into an imbalance. Enter the ego. The ego wants to be heard at all costs. It doesn't want others to speak, unless it's to receive praise and recognition. It wants to be the center of attention. The ego is not willing to listen. So how do we get to the point where we speak and listen in balance? #1: Awareness is key. We can't make changes if we don't recognize the habit first. #2: Understand that all the signs fall under the same category of fear. Fear that we aren't being heard. Fear that we aren't good enough. Fear that we aren't loved. #3: Recognize what is lacking in your life on an emotional level--likely what you never received as a child: feelings of worthiness, acceptance and love. Make a list. Don't rely on others to give you these emotional needs. Know that you are worthy and deserving of dignity, respect and love. Then give your Self what you need. #4: Acceptance of yourself, flaws and all. Then with that acceptance, a commitment to change. No, that is not a contradiction. What this means is that you don't beat yourself up for your flaws. When you see them rise to the surface (Awareness), like when you hijack the conversation and don't let someone else speak, stop and make a conscious choice to do something different. Practice listening more. Soon it will become second nature. 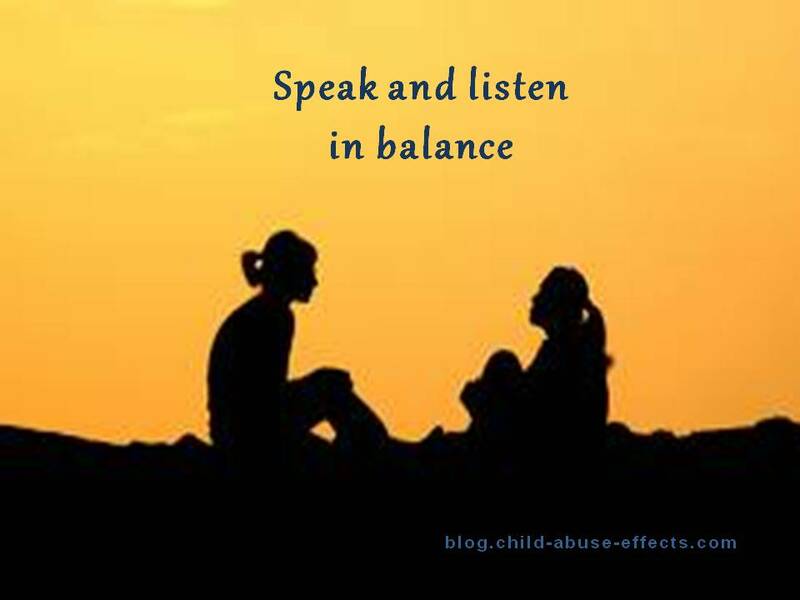 What are your tips for speaking and listening in balance?